Flew my PA28-181 from Barbados to St Martin (the French side). It is a little over 440 miles in a single leg. The trip was to get the annual done - it is being done on St Barts but I do not have the endorsement to land there, so it was picked up and I flew back commercially. Flew up four days before the current annual ran out and as it happens my medical too; there was iffy weather but early Saturday was looking good. Fuelled and pre-flighted the airplane the evening before, lodged the VFR flight plan, sorted out the customs with the ayscuda, prep'd the eAPIS. Up early, tried to send the eAPIS, would not send - so I emailed them - probably never ended up in the system. Off to the airport (TBPB) got there as the sun was rising. A repeat of the preflight - one never knows what may have happened overnight. So, full fuel, good for 6 hours at my speeds. Took off 6:45 am - climbed up through some patchy at around 3000-4500ft cloud to 6500ft a 1000 or so above the cloud layer - stayed there for 150miles, then climbed to 8500 to get above the growing cloud. Overflew, Guadelupe - a routine flight used the AP heading on the bug with occasional lateral excusions to get around towering cloud - did not use the altitiude hold as it has been playing up and I was passing over the towering cloud columns. All very simple, swapping tanks - I prefer to do ti every 30 minute, some I know favour every hour but I find it keeps one altert and I use the 0-30/30-0 on the clock (yes it actually works in my PA28. Saw the volcano on Monserrat and the new very short airport runway, another planned destination - "one day". Got to take a look at the airport on Dominica as I flew by, will have to land there one day - have done on commercial, ATR turbo prop, the approach on an east heading is fun, below tops of mountain, passing over the palm trees, some of ones fellow passengers actually praying out loud. 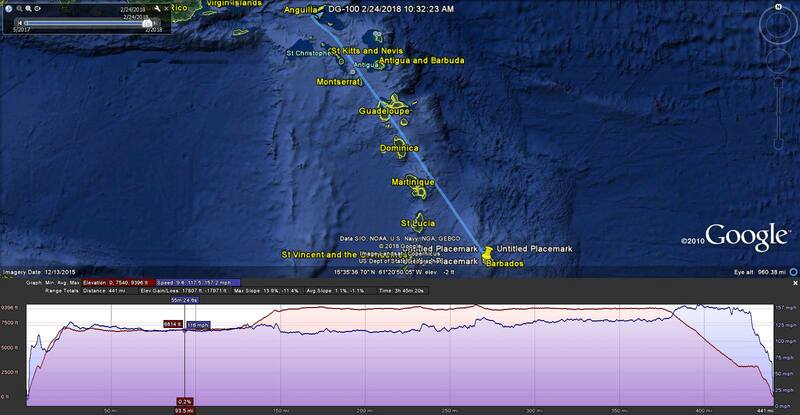 All was going well, started letting down just NE of St Kitts at around 375miles flown - all going well. Spoje with the Dutch St. Martin and then handed of the French for landing, then an "issue" - no reply on the radio - switched boxes and nothing. At this point I should have just gone back to the Juliana frequency but just thought lost comms so 7600 in the sqwark and tried calling nothing. By this time I was about a 4 mile final to Grand Case - thought one last try and yes, not the controller - so buzzing along now about a mile and a half and not cleared to land. So asked "am I clear to land" and got a "oh, yes of course" - I think the controller was flustered - maybe he has been away from the radio (a big no no). So coninuted on for a pretty good landing - hefty cross wind and switching around from the hills to the east. So that was my trip - 441nm in 3:45 from engine start to engine shut down, burned about 8.25usg/hr, maximum altitude was around 8750 briefly, maximum speed over the gound 156mph (descent), but typically 125mph. Airplane should be out of annual in a coupe of weeks and I will when I collect it take the chance to get by flight review done and also the check out to fly in and out of St Barts - if nothing else it will make the trip for the next annual easier. Lovely trip report! (that's a lot of water!) Any photos of Montserrat? The landing at Grand Case can sometimes be a mystery as the onshore breeze barrels along between the high ground either side of the runway. I am never too sure whether the Tower is simply an A/G service or AFISO. I was endorsed for St. Barth's but currently expired as last holiday abandoned due affects of Irma, however hope to get it back later this year if there are any light aircraft left airworthy at SFG. Good luck getting the endorsement when you return so hope you bet a sufficient headwind on Rwy 28 during your stay to enable the required approaches for validation. Be very interested to know who you get to instruct you in case the guys at SFG went out of business. I never understand the left hand downwind App past the three coloured rooftops over land for Rwy 10. If the motor gives up in a single, there is nowhere to go. Sorry to take so long to reply to this, not a great hanger out on here. I was instructed by Maxime Desouches - he did my annual and a repair on the skin of one wing after a hole got punched through it - he is also the guy you can see landing the Pilatus in YouTube videos. I did the training thing - it has worn off by now.